When I reorganized my room to accommodate two new bookshelves, I had to be economical with my use of space. Sure, there are my trade paperbacks, but there’s also my computer, some storage, actual books, a Nintendo Switch with an enticing Shantae: Half-Genie Hero for me to finish, a desk and a bed… mini-house fetishists would be proud. But the thing I’m most proud of, in terms of ingenuity, is my reading area. I’ve specially dedicated the space to reading, to keep me free of distractions. A fold-up stadium chair, a repurposed cushion, blank space on my shelves for what I’m reading at the time, even a makeshift table for my netbook, a place to store whatever I’m eating… and giving my cat a place to sleep. So… there were some delays since my last Don Rosa in Review came out! I’m sorry about that. You can thank Dr. GeoX for inspiring me to put out this little birthday present to myself. I had waited for two Don Rosa books to come out to allow me to better discuss the material in relationship to his development as an artist, one being the Fantagraphics release, the other being the third volume of the Don Rosa Classics. I’m not holding my breath on that last one coming out any time soon, more’s the pity, but I do have the Fantagraphics releases. With them, I finally, finally have an opportunity to go through Don Rosa’s Duck stories the way I had intended! Well. Except for one. 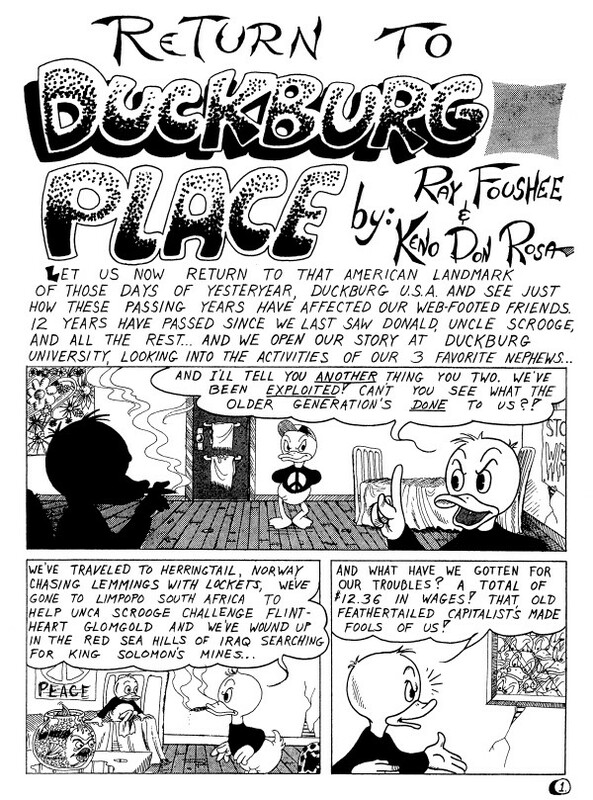 Return to Duckburg Place was written in 1970 with Ray Foushee, who also collaborated on ‘a handful of [Pertwillaby Papers] episodes’, and is technically the first Disney Duck comic Rosa ever worked on. I say technically because it was produced as an underground comic, starts with Huey Dewey and Louie smoking pot, and actually gets more messed up from there. 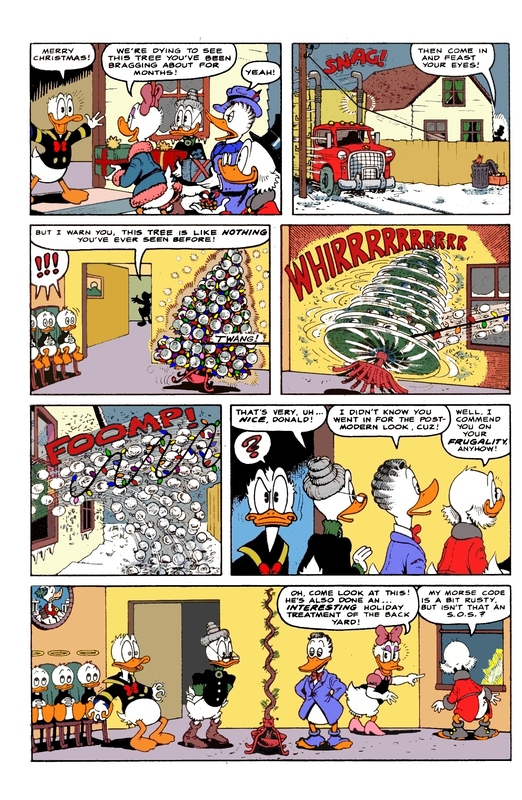 While this comic was published in European territories as part of various Don Rosa collections, the more uptight Disney of America wouldn’t allow publication of this story in the Don Rosa Library. I was fortunate enough to find a copy from an acquaintance to work with for this column. Funny what happens when Disney tells him not to publish things he worked on that fans want to read: somehow, it gets out there anyway. This is one of only three Duck comics he did in black and white, all of which were unofficial productions. This is why you see Zip-A-Tone on most of the characters, later used to remarkable effect on The Pertwillaby Papers and Captain Kentucky. It is also easily the darkest thing he’s ever done, outdoing even his “Casper the Dead Baby” jokes made during conventions and interviews. I really, really hope he’s joking. It makes sense the more you think about it, just look at that head… but anyway. I couldn’t think of a better way to return to Don Rosa in Review than this, with Return to Duckburg Place. Summary: Don Rosa holds nothing back in a dark, satirical, amateur production that slams the Disney Duck world and its characters, and I laugh hysterically at the thought of this same guy being most well known for his heart wrenching, brilliant stories that thrive on extreme pathos. Everyone has a dark side, and this is definitely his. 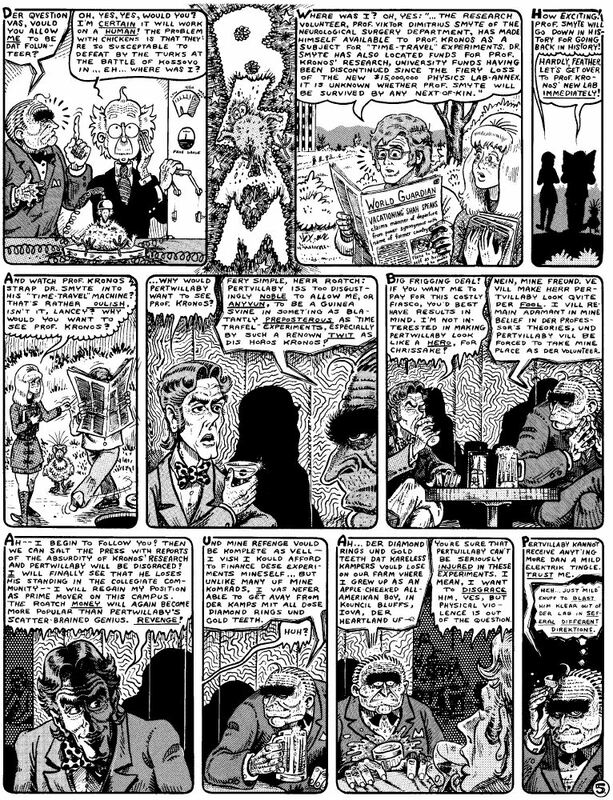 Here’s the truth: I wrote The Pertwillaby Papers review without ever intending to do a follow-up with Captain Kentucky, Don Rosa’s semi-sequel-but-actually-just-a-dream newspaper strip. I knew I would have serious problems if I tried. But the more I thought about it, the more I could not justify to myself why I wouldn’t say something about the comic. I knew I was going write about the third volume in the set when it came out. So why didn’t I want to write about this one? It took me a little while, but I realized why I was so resistant to the idea of reviewing it. While I have quite a lot to say about the contents of the book as a whole, the strip itself is a puzzle, and one I could not solve. So here is one of the strangest things I’ve ever written: four reasons why I’m not reviewing Captain Kentucky (and a review of everything else in the book to make up for it). The premise of Captain Kentucky is that Lance Pertwillaby is Captain Kentucky, a well-meaning and comically destructive superhero set in the real world Louisville, Kentucky. The real world meaning real Louisville landmarks, celebrities, and current events at the time of the comic’s setting, 1979 to 1981. It’s very tightly bound to real events, real places, and real people. Reading Captain Kentucky, I am in the position where I’m not just disassociated from a very specific setting, but a very specific time period. In effect, reviewing this comic strip is like asking me to research and report on the veracity of the claims contained in a travel brochure for Pompeii before the volcano erupted. Captain Kentucky is written in a format that I can’t categorize. It’s not written like the newspaper strips I love, such as Mickey Mouse, Calvin and Hobbes, The Far Side, Peanuts, or even The Pertwillaby Papers. A typical Captain Kentucky strip was published weekly in the Sunday papers, half a page per strip, with the occasional full page episode. And it’s difficult to talk about precisely for that reason. There are stories being told in Captain Kentucky, but the strips fall in to a strange hybrid between standalone and continuity-based storytelling. It’s a strange feeling, where I’ve read some four to eight pages of a storyline, only to start reading the next page and think, “Ah, okay, I guess that was the end of that.” It felt like a sequence of events that we saw a piece of, rather than a continuing story. And it’s just not something I’m prepared to delve in to because I don’t understand how or why it was written that way. I’d be remiss if I didn’t point out that the half-page strips allowed Rosa’s art to shine in a way the original 128 strips of The Pertwillaby Papers did not, and that he is astoundingly capable of maximizing the content of each strip relative to the space he’s given. Just look at the above strip for an example. Early episodes of the comic were definitely cluttered, but eventually he struck a good balance between the two. The end result is surprisingly clean considering how much he’s doing with the space. In order to understand why it’s difficult for me to review Captain Kentucky, we have to go to Storytelling 101. Specifically, we need to talk about the difference between the premise of a story and what it is about, and where Captain Kentucky might have gone off the rails. Let’s take a look at another comic strip as an example. The premise of Calvin and Hobbes is that Calvin, a hyperactive and imaginative six year old, plays with his imaginary/maybe-not-imaginary friend, the stuffed animal Hobbes. But that’s not what the comic is about, that’s the premise. A premise on its own means nothing, because it is simply the vehicle in which to tell stories. It’s the about that we remember. Calvin and Hobbes is a comic strip about a hyperactive and imaginative six year old and his imaginary/maybe-not-imaginary friend Hobbes the Tiger, and how even though there are sad things about humanity’s nature and the world we live in, there are just as many wonderful things in the world to discover. The reason I didn’t talk about this concept in The Pertwillaby Papers review is simple: the comic is explicitly focused on comedic adventures, not emotion. It’s smart, fun escapism, and there’s nothing wrong with that at all. But Captain Kentucky is a completely different kind of comic. While still saturated with the typical wit and art I expect from Rosa, it’s more personal, starting with the premise: it allows him to show his love for his hometown, lampoon and pay homage to various famous figures, and express his opinion and viewpoint to a willing audience. As I said earlier, the premise of Captain Kentucky is that Lance Pertwillaby is Captain Kentucky, a well-meaning and comically destructive superhero set in the real world. But that’s not what the comic is about. It’s actually very difficult for me to figure out what Captain Kentucky is about, because the comic is doing all sorts of different things. Little things, big things, fun things, good things, bad things. 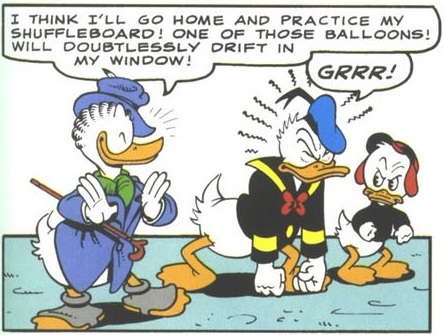 But if I was forced to make my best guess, I’d say the theme was Don Rosa’s frustration with people. 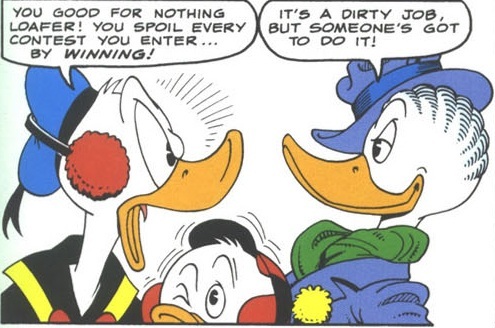 I don’t mean to say that the entire comic is Don Rosa taking his personal issues out on the world, far from it. He is completely honest in his opinions on subjects, and writes in a way where he’s allowed to express them, but Captain Kentucky is, in fact, a comedic adventure strip starring a bumbling superhero. But the way it was executed somehow led to a sort of insularity, and was therefore more difficult for me to connect to as a reader. That strip is all the more telling when you read the article about why he retired from comics, and shows exactly why he worked at it for so long. I do admire his efforts to expose himself on a more personal level with Captain Kentucky than any of his other comics. Even the space between the tiers of each strip was used to express his personal viewpoints on whatever he felt like saying, popular or not. To be so open, not to an international audience like the one he deals with now, but to the people of the city you grew up in, is not the act of someone who was willing to compromise or play it safe. When it comes to my likes and dislikes, I don’t have too many grey areas, but Captain Kentucky definitely falls in to that place. For every pro I put on my list, there’s a corresponding con: The art is great, but Rosa never really mastered how to lay out a half-page strip in a way that fully shows it off. I love the premise of the comic, but I’m not sure what to make of the execution. The jokes can be funny, but I can tell I’m only catching one out of every three he’s throwing at me. He’s willing to try new things throughout the strip’s run, but it feels unfocused. The comic has a strong personal voice, but I feel somehow distant from it. I just don’t know what to make of this comic. And that’s my list, told in full. Hopefully now you understand why no matter my efforts, I simply can’t review Captain Kentucky. The rest of The Complete Captain Kentucky, however, is more than fair game. Bonus Features: Unlike The Complete Pertwillaby Papers, I’m not actually in this book… but I can hardly hold that against what they did include! With 64 pages of bonus features (including the two bonus comics of Phalanx and The Home Computer Handbook) consisting of in-depth interviews, profile pieces and rare art, if you’re a Rosa fan the book is worth checking out for these pages alone. The QR codes, meant to help you look up some of the locations and people in this book, are a great idea. But I think they would have been better served as pages hosted on an individual site, written from Rosa’s own perspective, rather than linking to things like wikipedia. Phalanx: Rosa, in his introduction to the bonus comics, mentions he tried to submit Phalanx for syndication, and likely would have continued to do so if he hadn’t already had a job waiting for him after college. 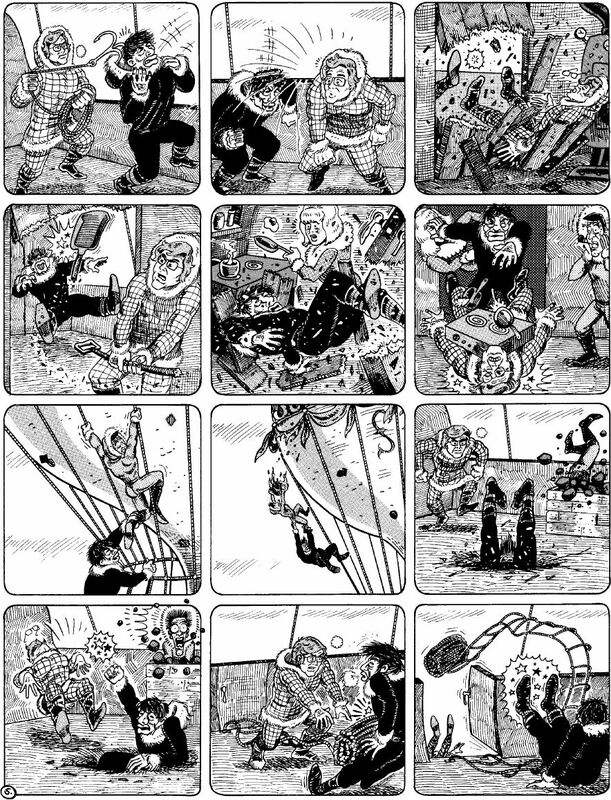 While the twelve strips of this comedy-adventure printed here show promise and could have likely been reworked to something very interesting (and I have heavily praised his work on The Pertwillaby Papers newspaper strips), I can understand why Phalanx wasn’t run. Each strip had a much slower pace than an episode of the Pertwillaby Papers, and without the recap panel he used so effectively there, each strip lacks context as a standalone piece. The comics tended to lack strong gags, despite being a comedic adventure strip. While the art is typically excellent Rosa, the layouts of each strip felt wasteful. The story was arguably better suited for a comic book, or a half-page Sunday strip, than running in a daily newspaper. But if nothing else, it’s an interesting look at the road not traveled. Just because something is flawed, that doesn’t mean it’s not worth reading. 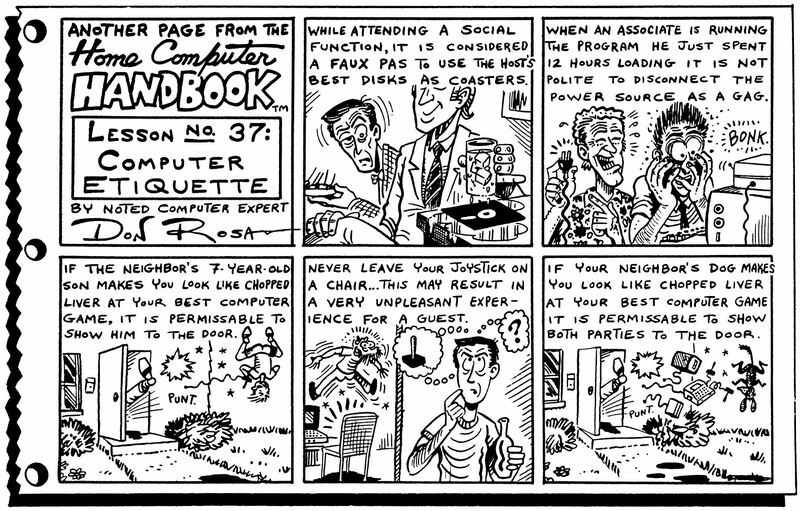 The Home Computer Handbook: If you’ve ever dealt with computers, these one-off comics on tech issues printed for a local computer club still resonate. I don’t have much more to say about them, just that they really make me laugh, especially having grown up in a tech-savvy household. I really think people don’t give Rosa enough credit as a cartoonist, himself included. Presentation: As it is part of the same collection as The Pertwillaby Papers, the book is beautiful, with the same hardcover and thick, glossy paper. Horizontally formatted at 8.2 x 11.6 inches, the artwork is reprinted as big as was possible. The full-page strips are spread across multiple pages, but it’s a compromise that’s both understandable and hardly noticeable, considering the way Rosa generally sticks to strict tier-usage in his layouts. The in-depth interviews, originally printed in magazines, have been shrunk down in a smaller font to fit the book’s format while keeping their original layouts. The amount of material successfully crammed in to this book is a testament to how much care was put in to its construction. Unfortunately, there is exactly one thing in the book that I really can’t excuse: there is no table of contents. There was one in the Pertwillaby Papers, but this book needs it more due to the sheer amount of bonus material in it. Final Thoughts: I don’t regret buying the comic, nor the time I spent reading it. And if you’re a Kentucky resident or a Rosa fan, I strongly encourage you to check it out for yourselves. The book itself is great, and would be interesting even without the 150 strips of Captain Kentucky. But it’s gonna take someone a lot smarter than me to review them. The Complete Captain Kentucky can be purchased at www.danibooks.de with a little help from Google Translate, with digital copies available from Amazon.com. When I look at The Pertwillaby Papers, I can’t help but think of Aaron Sorkin. Aaron Sorkin created and wrote The West Wing, one of my favorite shows, and is well known for packing every episode with wall-to-wall dialogue. Upon finishing the show for the first time, I was eager for more of his work, and found his first show: Sports Night. It was a critically acclaimed sitcom from the same creative team of Thomas Schlamme and Aaron Sorkin, but cut short two seasons in to its run. And when I popped it in, I was shocked! Exchanges I saw on The West Wing had originally appeared in Sports Night, having been re-purposed in a different context. Scenes, speeches, subplots, all lifted from The West Wing’s predecessor, as though Sports Night had only been a rough draft. Sometimes Sports Night had the better take, though more often The West Wing did. But whenever I saw that kind of lift, I couldn’t help but marvel, not just at the brazenness of stealing from yourself, but the way context and execution can completely alter an idea even from the same author. You can see why The Pertwillaby Papers is fascinating from that perspective alone. Don Rosa has openly admitted that Lost in (an alternative section of) the Andes was at heart an Uncle Scrooge story, and later rewrote it as Son of the Sun, his very first Duck story. Stories, characters and jokes from The Pertwillaby Papers are shamelessly used for his Duck stories, sometimes made better, sometimes made worse. I purchased the books as a matter of curiosity, and much of my joy reading it was playing the same game I do when I watch Sports Night. But there are many who adored The Pertwillaby Papers before Rosa ever did Son of the Sun, and I think it’s worth examining from that perspective. For that reason, I won’t be comparing it to his Duck work in this review. It deserves that. So let’s talk about the collection of this beloved adventure comic by my favorite comic book creator. (Episode #1-65) Untitled: This story (not even retroactively given a title) introduces the main cast, with a storytelling style closer to the traditional four panel gag-a-day newspaper comic than the adventure series it would become. Based around the premise that Lance is trying to make his way through college without official enrollment or tuition, and villains Smyte and Roatch attempting to expose him through petty revenge, the college setting allowed for a great cast of characters and humorous scenarios. What’s particularly notable about this section for me are some of the different ways Rosa told the story. Some strips didn’t feature the main cast at all, instead allowing side characters to get a ‘scene’ to themselves. This created a more fully populated world, rather than the barren vacuum world most newspaper casts exist in. The vertical recap panel for each strip was a genius way of conserving space and minimizing “As you know”s in the dialogue, and of course, the use of personalized speech bubbles helped to give more personality to the characters in this limited space. While the art may have been a more amateurish Rosa, it is still Rosa, best evidenced by the anti-abrasium sequence. It may not be Rosa’s favorite, but I think this is the funniest of the Pertwillaby Papers tales. All that in the span of a four-panel sized newspaper strip. Brilliant. One of the great advantages of the four-panel format is its brevity. There’s a sequence at the beginning which is entirely exposition, but beyond that, the story keeps moving forward, with each strip admirably attempting to stand alone while still building towards the iconic climax. And at 61 strips, the story never feels like it’s wearing out its welcome. It is an extremely well-executed piece of comic storytelling. And despite my affection for the later tales, I believe that this is the best story of the Pertwillaby Papers, devoid of filler or over-complication. Why the comic didn’t end up in syndication upon Rosa’s graduation I will never, ever know, because I would love to have seen Rosa progress as an artist in this medium. (Episode #128-133) Sub-Zero: After leaving college, The Pertwillaby Papers was revived in a serialized comic book format. The episodes (as he titles each strip/installment) became 10-15 pages, and he clearly relished the opportunity to cram as much as humanly possible in to every panel. The dialogue, character designs, set pieces, sequences all became far more elaborate and detailed, showing what Rosa could really do if he had a chance. And seeing the difference blew me away. The story was a three-way race through the Arctic, with murder, betrayal, Nazis, and the occasional poop joke. Sub-Zero marked the comic’s first stabs towards suspense, and pushing more towards black comedy. Each episode moved the story towards a grand climax, reading like a story broken up in to six installments, while still being a largely readable entity on its own. No easy feat in the short span of time he had to tell the story in each episode! But while I might be a fanboy, I’m not a blind fanboy, and I did see problems with the story. The first being what you see above: The recaps at the beginning of each installment. They’re delivered by the characters rather than captions, and it is a frustrating reading experience: this method makes an effort to treat every reader as though it were the first time they’d ever picked up the magazine, which I understand, but it wastes space on the page and is tedious to read. No new information, story elements, or character information are revealed within these recaps, and I had to stop myself from skimming over them the first time through. While the one you see above made an effort to inject humor in to the process, it’s still a daunting read. With careful application of caption boxes, it would have read more smoothy and allowed for more of the story to be included in each installment. The second, and I’m hesitant to say this because of the time it was written, is that the characters are not particularly well developed. I can’t tell you very much about them or their personalities, and this is especially problematic with Lance – the main character. There’s very little about him outside of his obliviousness, verbosity and preference for milk, which makes him a more flat and reactive character. This isn’t a great way to get jokes out of a character, or draw in the audience. The comic isn’t designed to delve in to the psyche of the characters it’s portraying, and that’s fine, but without some character motivation it’s very easy to feel disconnected from Lance. Sub-Zero is still a quality piece of storytelling, especially for its time, managing to take a complex story better suited to a movie and make it play in a comic book format. There are a number of great, memorable moments throughout, and it ends just as it should. And a page from Vortex. I can only assume that during the writing of Sub-Zero, Rosa was saving up to buy the gallons of black ink he’d end up using in his take on a journey to the center of the earth. Vortex is gorgeous, and my mouth was hanging open from the painstakingly detailed artwork. For me, that alone would have been worth the price of purchase. While Sub-Zero was telling one story across six installments, Vortex better utilized the serial format by writing each episode as a distinct entity in and of itself, lending a uniqueness to each installment that made the comic more varied and interesting. Each episode still advanced the overall plot, was enjoyable as a piece of storytelling taken by itself, and ended with a cliffhanger for the next episode. 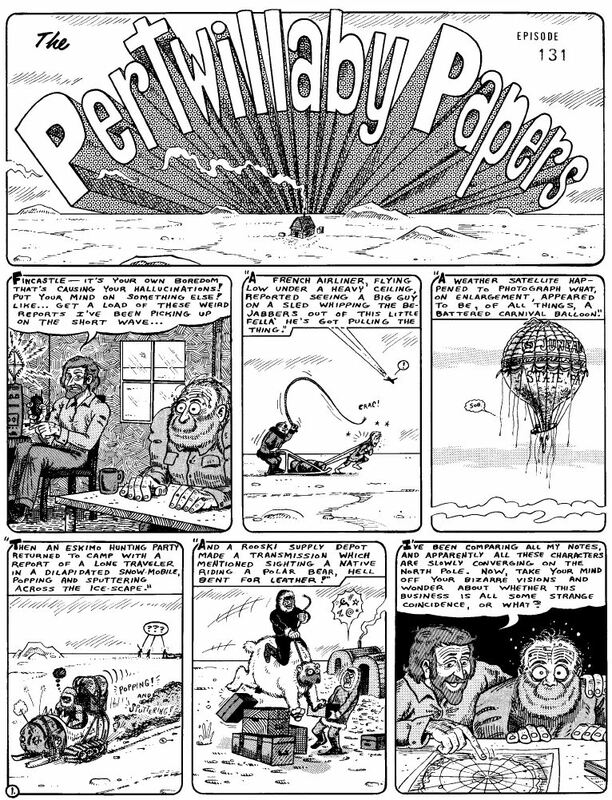 While that may not sound like much of a difference compared to Sub-Zero, it’s actually much closer to the newspaper format The Pertwillaby Papers was born from, extrapolated to comic book form to great effect. And you have no idea how much better Vortex reads because of these changes. It can still feel its length sometimes, but no one ever said you have to read the whole thing in one sitting. If there are any comic writers reading this, I suggest you steal liberally from the way he tells this story. (Episode #139-141) Knighttime: Moving away from the varied format of Vortex, Lance and company find their way to the time of King Arthur. Knighttime is an unfinished tale (though he reveals how it would have ended in an interview), spanning only three episodes, and it’s a real shame. The Pertwillaby Papers had the option of continuing through Fantagraphics in the form of graphic novels, but it appears Rosa chose to work on Captain Kentucky instead (why he didn’t ask to do The Pertwillaby Papers as a newspaper comic is a question I ask myself every time I read that collection). That said, Knighttime has great scenes, better characterization for Lance, better staging and layouts… and is oppressively difficult to read. The sheer amount of text in this story makes me cringe. I can forgive some of Rosa’s quirks from earlier installments, which tended to be text-heavy to keep the plot moving in this short space, but he went way over the line with this last tale. As long as you prepare and pace yourself throughout the story you should be fine, because once you get past the inelegantly written dialogue Knighttime is truly a spectacle. It never stops bringing the funny, and some of the best moments of the series come from these last three episodes. And I have to say, the best cliffhanger Rosa’s ever done was the last panel of the whole series. 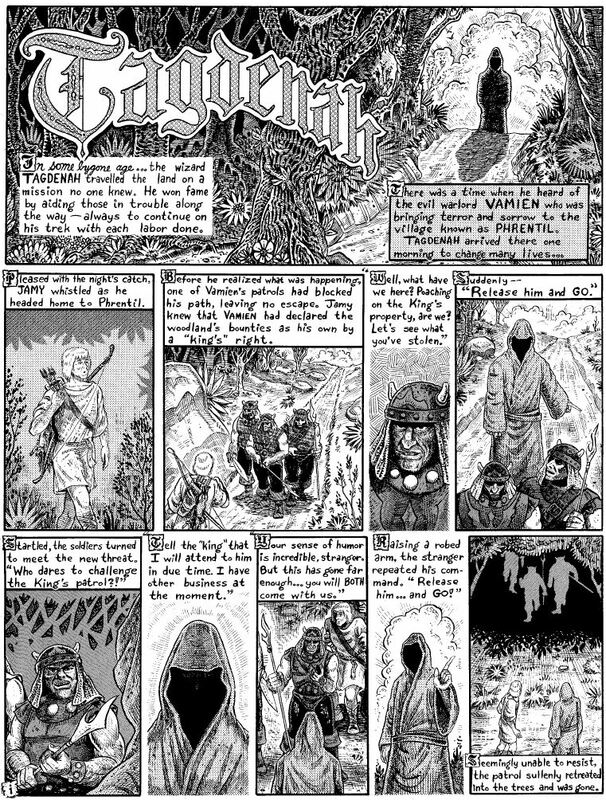 Khulan: This fantasy comic, written by Rich Fay, is pretty weak. It’s Rosa art, which is something, but it’s not very good Rosa art: unsurprising for content produced by two high school juniors/seniors. 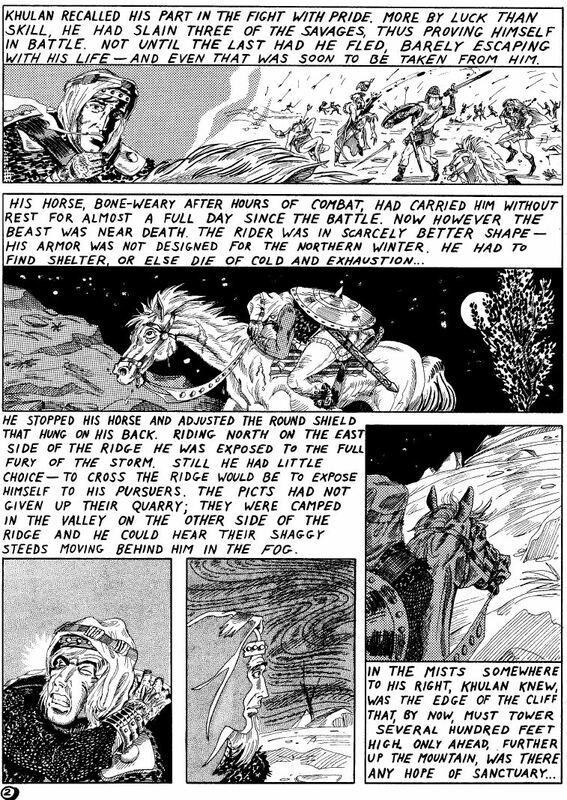 With the use of prose panels in the vein of Prince Valiant, Khulan proves that not all experiments are successful. Tagdenah: These two fantasy stories written by Patty Payne, starring the mysterious roaming wizard Tagdenah, are a serious departure from the typical Rosa style of art and storytelling. They are a fascinating look at what might have been if he’d ever developed a permanent partnership with someone. Even the strange style of captions for dialogue works to fit the story’s mood, and I’ve never seen that used correctly before: as much as Rosa bemoans his lettering, the story would have fallen apart with a lesser letterer. Fitting a complete story in to such a small page count, especially a more serious one, is no small feat: I am truly impressed. I would love to have seen more from her. Bonus Features: Now, I’m in the bonus features, so I’m a little biased. But my interview with Rosa isn’t the only thing there: there’s a cover gallery, an interview with David Campiti, newspaper clippings, convention drawings, previous introductions and other great miscellaneous Pertwillaby content. It’s as complete a collection for The Pertwillaby Papers as anyone could realistically hope to achieve. The only thing missing for me is that Rosa didn’t write new, individual introductions for his Pertwillaby Papers stories, but rather an introduction for the book as a whole, and another for the non-Pertwillaby Papers comics. Presentation: Absolutely amazing. At an oversized 12.75″ by 9″ and printed on thick, beautiful glossy paper, the artwork is presented with in its full glory, with all the detail as it deserves to be seen. The actual layout of the book by Jano Rohleder is excellent, tucking in as much content as possible. However, I would have preferred the covers be placed at the beginning of each story, and for episodes to be marked by page number in the table of contents. There are also a couple of very minor typographical issues in the text that I’m sure will be corrected in the next printing. There are, however, some printing errors. 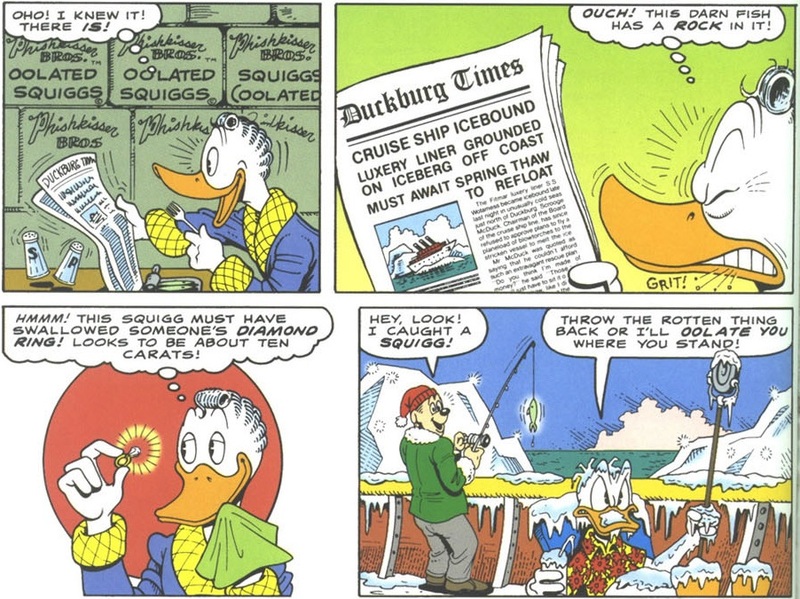 The first panel of Sub-Zero has been clipped, possibly from improper scanning, as seen in the comparison between the Fantagraphics and Don Rosa Classics printing. There’s also a printing error I can’t explain, seen below, though it only occurs in this one spot. Unfortunately… one thing absolutely does interfere with the reading. 2/3rds of a page from Tagdenah are missing. Editor Jano Rohleder has promised to include a sticker that you can use to re-insert the missing panels, and the error is not present in the digital copy. Despite how it may sound, The Don Rosa Classics are still the most beautifully put together comic compilations I own, and the little faults don’t detract from my undeniable pleasure reading the book. Final Thoughts: For those of you who know Don Rosa as someone with a talent for Duck comics, you’re right. But he is more than that. He is a comic book writer, penciller, inker, letterer, and cover artist, and whether it’s with Scrooge McDuck or Lance Pertwillaby, he knows how to create great comics. If that’s what you love, this is the book for you. And if you’re going to get anything out of this review, let it be this: meticulously researched, obsessively detailed in its art and writing, funny, and verbose just shy of a fault, The Pertwillaby Papers is Don Rosa to the bone, and I love it. The Complete Pertwillaby Papers can be purchased at http://www.danibooks.de with a little help from Google Translate, with digital copies available from Amazon.com. 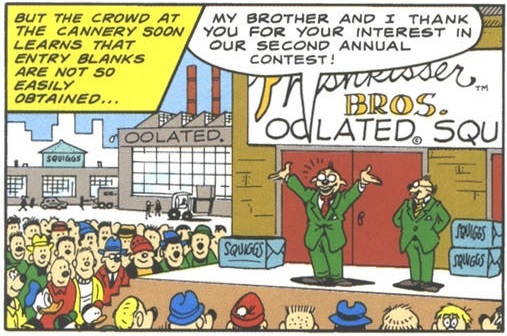 Story: Donald and Gladstone compete in a contest sponsored by the manufacturers of Oolated Squiggs, because Donald has never read this kind of comic before and doesn’t know how this is going to end. Through the use of SCIENCE, the contest becomes farcical, and the nephews cleverly attempt to cheat fate on their uncle’s behalf. But even when Gladstone loses, he wins. The Review: I’m not sure how to react to this story. 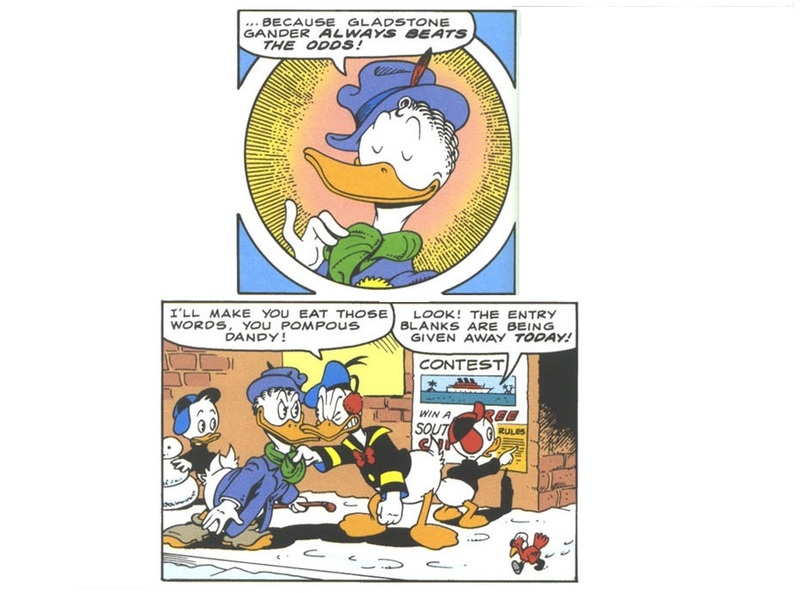 It’s a Donald versus Gladstone story with a… twist? I guess? The perpetually lucky character lucks out in the end, and Donald fails. That’s kind of the opposite of a twist, but it’s played as one. Usually in Barks comics when Donald suffers it’s because he was acting like a twerp, not just because Donald is the universe’s chew toy. It just doesn’t seem quite right. I take some satisfaction in knowing he probably broke his teeth. The whole story feels workmanlike in that it takes no chances, the artwork is serviceable, it has a number of solid jokes in it, and as such it fits the bill for a typical ‘good’ Disney comic. If that sounds like an indictment against Disney comics… well, there’s a reason Rosa stood out, and it’s because he usually didn’t make comics like this. Unrealistic dialogue from the nephews? Only if you’re not dealing with Gladstone. That said… look at this guy. I want to punch him so hard he flies in to next month’s issue. He is obviously not a very active villain, very much like “Nobody’s Business”, but here you hate his guts so much you really want him to lose. This is solid, (though somewhat ham handed) characterization, because it means you want Donald to win. You care what happens. For good and for ill, that’s really all Gladstone is meant to be and it’s all he can be in a story like this. He’s an antagonist that you hate and want to see not just lose, but beaten. It’s exactly what you need in a story like this. I’m talking about the art in this series a lot more than I really want to, but a big part of that is because Rosa’s early art is weird. It’s not that he started off bad, but he has some quirks that you can’t really ignore. Like in this story, where Rosa appears to intermittently forget how to draw Gladstone. I mean, on a technical level, he’s obviously capable of doing a very well drawn Gladstone. It’s like looking at a beautiful, narcissistic coin. Any artists want to tell me what’s up with these panels? Well this… this is really not right. His bill is screwed up, and the perspective is all kinds of weird. He’s actually drawn fine in some parts of the story, but out of the 26 panels Gladstone appears in within this story, the profile angle is used in 9 of them. His Gladstone became much better throughout later stories. But even when he drew a Gladstone poster ten years after the publication of this story, he used the profile shot. Part of the problem is that no other characters are really drawn like Gladstone. With his unusually large bill and curly head of hair, even when he’s drawn ‘correctly’ (meaning to Barksian standards) he still looks out of place amongst the other Ducks. Even Barks didn’t really succeed with fitting him in as often as you would expect, based on my reading. That said, I would bet there is a specific Barks panel that Rosa is drawing from for these profile shots (which he uses in this story and many others), but as always, my Barks knowledge is not up to snuff. But that unusual bill length brings me to a point I have wanted to express for quite some time. 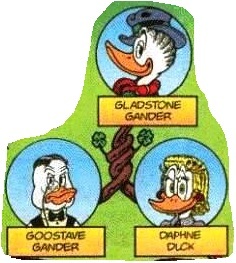 And since I’ve had a series of negative reviews up in a row (that streak’s broken next time, folks), pardon me while I have a strange interlude: Gladstone Gander is drawn weirdly because he is biracial. Oh yes, I’m going there, and you can’t stop me. The official Rosa family tree… and yes, Gladstone is drawn in profile. 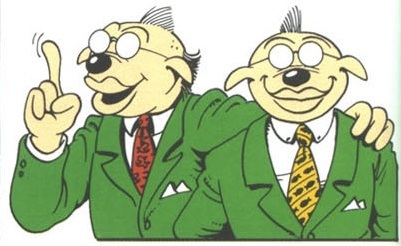 For reasons unknown to me, “humans” in Disney comics are drawn with black noses and dog ears. They are colloquially referred to as Dognoses, and are the default ‘race’ within the Disney comics universe. Compare this to our heroes, who are, well, Ducks. We don’t see anyone with their body type in the crowd. You know who else we don’t see in the crowd? Yes I did come up with those names on my own, thank you. The more you think about it, the more confusing it gets. Are all Mousemen black? What would a black Mouseman look like if they’re not? Why are the Ducks of Tralla-La all Dognose sized? WHY DOES GYRO HAVE HUMAN FEET? 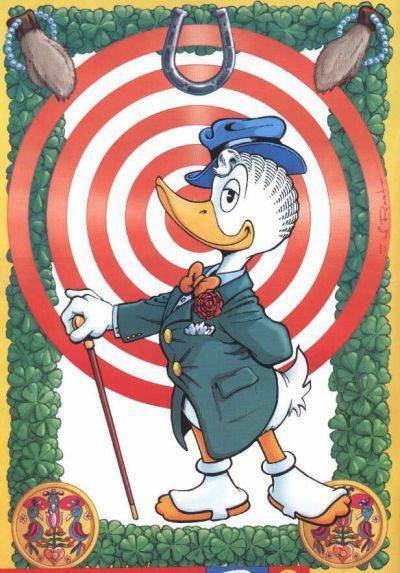 But the point is this… Duckburg is basically a honky town, and Gladstone Gander is the son of a Duck and a Gooselip by way of Daphne Duck and Goostave Gander. His bill looks like neither of theirs. Either he is some sort of mutant freak in a way totally unrelated to his race, or his mixed parentage gave him a totally different physical attribute than his racial background would suggest. Is his pain that of a man searching between two cultures, a minority even amongst other minorities? There are but a few Ducks in Duckburg, and the only Gooselip known to us is a farmhand miles outside of town. Could this be the secret behind his obnoxious, hateful acts? I know a guy like this. I almost punched out a guy like this. … nah… couldn’t be… right? These fish people scare the crap out of me, and my chart has no explanation for them. I’m not perfect, what do you people want from me!? Continuity: Beyond the obvious oolated item in question, a Barksian reference, and a one-off panel relating to “Race to the South Seas”… that’s it. Sorry folks. The ball really gets rolling next time, with the deservedly classic “Last Sled to Dawson”! The Story: Scrooge buys a newspaper, and must chase it down when the wind blows it out of his hands. The Review: WARNING! THE FOLLOWING REVIEW IS INCREDIBLY DIDACTIC! I grew acquainted with the Ducks from The Life and Times of Scrooge McDuck. Then I read some of Rosa’s stories, realized how referential they were to Barks, read some of Barks, more of Rosa, more of Barks, back and forth, until I had read all of Rosa’s stories and a good deal of Barks’. That background is how I knew that this story was not written by Rosa, because the Barks/Rosa Scrooge would never, ever pay for a newspaper. “The Paper Chase” was written by Gary Leach, one of the higher-ups at Gladstone. As far as I can tell this is Leach’s first ever original comic script, having served mostly as a translator and letterer prior to this. Rosa would draw two more Leach scripts, both of them two-pagers. Of the three, this is the bad apple of the bunch, and earns that distinction by… well, you’ll see. The story is ultimately harmless in that it isn’t some hyperbolically terrible monstrosity or anything, but it’s very easy to break down the problems of this script and why it needed another draft before it went to an artist. And since I like to give you some bang for your buck, I’m going to do just that with a session of Comics 101. Apologies in advance, Mr. Leach, I promise you wrote other gag pieces I really liked. It only LOOKS like an ominous sequence of Scrooge about to be run over by a truck. 1. It violates common sense regarding how someone like Scrooge would get details about the stock market. If Scrooge needed a paper it could have been for a number of other reasons, but because the stock market has to do with money, it’s why Scrooge needs a paper. It’s lazy and obvious and worse yet, removes the opportunity for an actual joke about why he would need a paper. 2. It goes against the Barksian detail of Scrooge not paying for a newspaper. Some of you are going to think “Well, Disney comics as a whole don’t take place in any established canon, it’s all open to interpretation by the individual artists and writers”, and you’re right. Further, while Rosa’s comics take place in his own canon, this is not a Rosa story, it is a Scrooge story that has Rosa art. We’re going to talk about continuity a lot in this series, but for the purposes of this entry let’s confine ourselves to being true to the character. 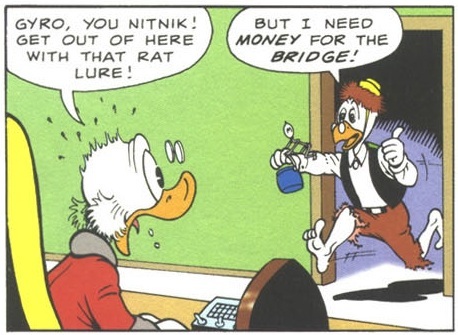 I think we can all agree that Scrooge wouldn’t pay for something unless there was a pressing need for it and there was no other way around it. At least, not when he’s on-panel. A character can act outside of his regular pattern if there is a convincing reason like a ticking clock or other extenuating circumstances, but that isn’t what’s happening here. Scrooge has no need to pay for a paper for any logical or gag-based reason. There is no time crunch, so he can simply find one tossed aside in the garbage, on a park bench, or any number of other places, and has actually done so in other comics. This makes his chase seem not humorously over-reactive, just pointless and stupid. An entire page of setup in a two page story. This is wrong. 3. I didn’t really think a two page story could be poorly paced, but I was wrong. The entire first page establishes that Scrooge has purchased the paper, is walking down the street, and has the paper blown out of his hands. The second page devotes three panels to actually chasing the paper (one being irregularly sized), and the last three to set up and deliver the final joke. This story could have been told in one page with more economical layouts, and I probably would have had less of a problem with it if that was the case. If it was going to be two pages anyway, the actual chase should have started earlier, been more visually varied, and given a better sense of visual continuity from joke to joke. 4. This one is entirely on Rosa, because the artwork for this story doesn’t work. 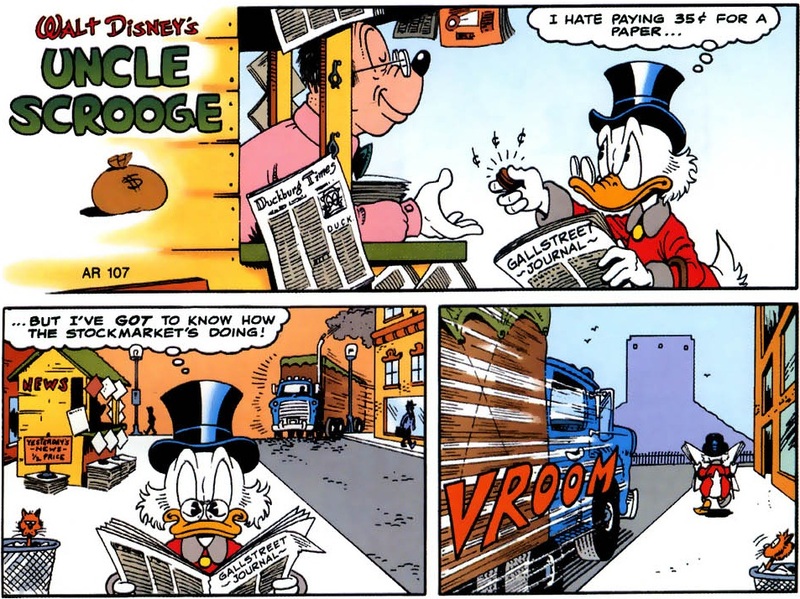 He doesn’t create a sense of motion for the papers in the wind and far, far worse, Scrooge’s expressions during these action panels are oddly flat. 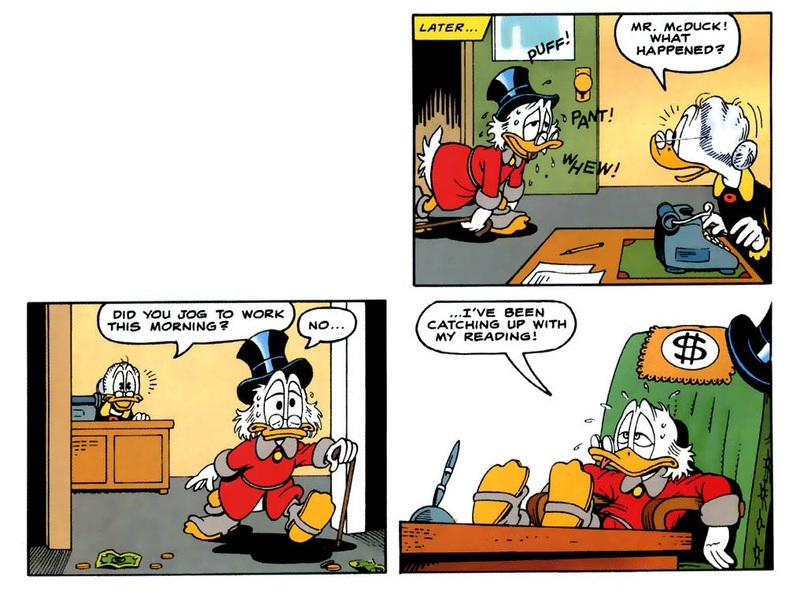 Bill Watterson of Calvin and Hobbes said that whenever he couldn’t come up with a good script he went all out on the art, but here Scrooge is incredibly subdued in the places he needs to (and logically would) BE at his most expressive. 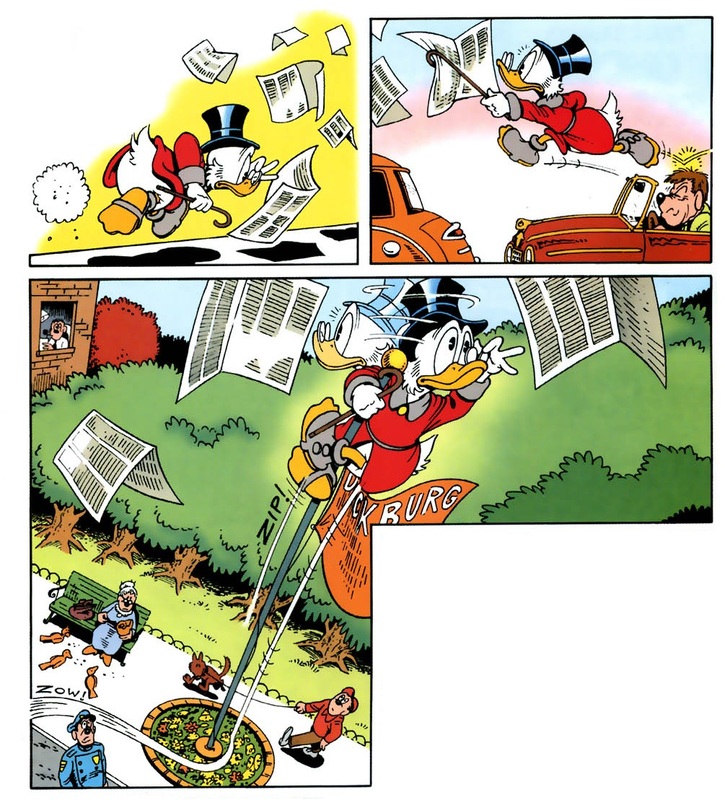 It doesn’t even match the visual jokes in the final panel, because Scrooge doesn’t appear to be exerting himself with these feats of acrobatic wonder. This picture compared to the one above is an example of what I like to call a “complete and total disconnect”. 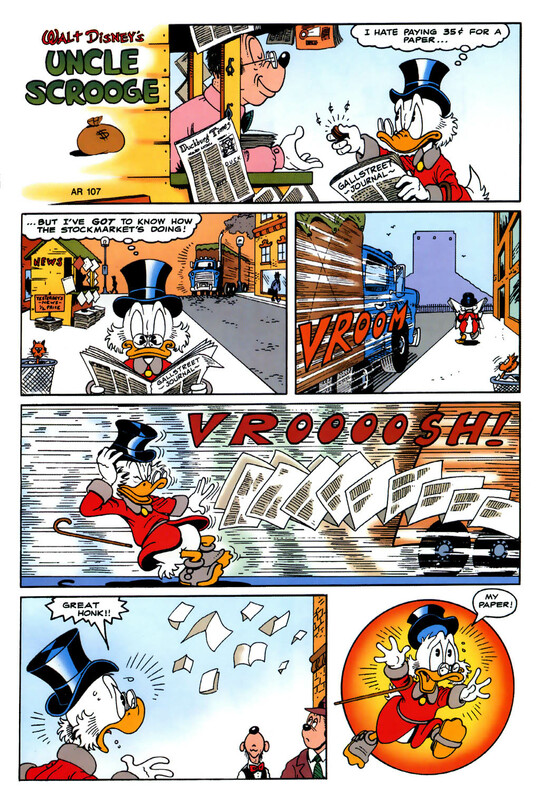 And of course, to top it all off, Scrooge enters his office without the paper he had been chasing the entire story. 5. “Paper Chase” isn’t funny. You can’t objectively prove something isn’t funny, that’s not how humor works, but this is my shot at trying. The opportunities for gags are either misfired or not taken at all. And that’s that. The actual concept has a lot of potential for humor, but a story’s success is always, always in the execution. I’m not saying Leach can’t write (I actually really, really like “Fiscal Fitness” and think “Rocket Reverie” has a lot of good gags in it, but those are other entries), but I think whoever approved the script really failed him here by letting him turn in what should have been an early draft. Rosa’s art didn’t do him any favors either, being just vaguely serviceable rather than an enhancement of the script. Despite all that I said, I wish Leach had continued working on gag stories like this. I very much enjoyed “Fiscal Fitness” and “Rocket Reverie”. The only non-Rosa story I’ve seen from him was a DuckTales story, “Flights of Fancy”, and I thought that had some great gags too, so it’s not like Rosa ‘carried’ him through those other two stories. But like many early efforts from writers and artists alike, this story just isn’t good. Continuity: This gets the very first appearance of the non-canon stamp from me, simple as the story is, by virtue of it not being in character for Rosa’s Scrooge. I will award the non-canon stamp to any story that irreconcilably contradicts established Barks or Rosa canon by virtue of ignoring plot points of past stories, character motivation, or other such factors. But if it was canon, it would be Rosa’s first appearance of Scrooge’s secretary Miss Quackfaster. The Story: The Universe hates Donald Duck and doesn’t want him to enjoy a Christmas tree he spent months planning to set up for his family. I wonder what Donald did to the Universe to ruin its Christmas spirit. The Review: Carl Barks tended to work in four distinct formats. The 1-page gags, the 4-7-page gags, the 10-page gags, and the full length adventure stories. The 1-pagers were for the inside and back covers, the 10-pagers for Walt Disney’s Comics and Stories, and the adventure titles were whatever length he needed them to be, topping out at 33 pages. The 4-7 pagers were used either because of mail code restrictions or because the adventure story didn’t fill out the page count needed to fill the full comic. They established the plot, escalated quickly, and led it all to a strong finishing gag. They weren’t so much stories as much as jokes with a big, enjoyable build-up. It really is a testament to Barks’ efficiency as a storyteller and sense of humor that he could do so much in such a short period of time, and you can point to “Somethin’ Fishy Here” as a perfect example of this format. So now you understand the template this story was based on, and what I am forced to compare it to. “Fir-Tree Fracas” has a nice sense of escalation throughout its first three pages, but it falls apart with its climactic gag. So let’s examine the entirety of page four! I’m often impressed by the way Rosa uses motion and timing in his comics. Looking at this page, you can see the scene playing out between panels, and the panels he chose serve as shots that wouldn’t be out of place as storyboards in animation. Panels 2-5 are extremely well constructed, conveying Donald’s emotion with a strong opening expression that carries the tone of his voice while he remains off-panel. The sound effects sell the ruination of the tree and give it a sense of believability (though I wonder if FOOMP! is the best he could have chosen for panel five) by drawing you further in to the scene. Panel Six gives you a further sense of buildup from the perspective of the characters, which is a necessary change of pace to draw you back in to the scene. But… when you hit panel seven, the punchline falls totally flat. You could pretty much go two ways with this punchline: The family is drawn to look outside by what became of Donald’s tree, or the tree itself is ruined in a way which is funny to the reader. Here, we have a mixture of both, with the visual focus being put on the ruined tree. Visually, this is… boring. The reaction shots of the characters aren’t particularly funny, and the minimalist tree isn’t an eye-catching visual. I need one or both to work for the joke to land. But more worryingly, I’m left wondering what the ornaments outside look like because the characters are pointing out that there is something interesting for me to look at off-panel. For a joke like this, if you have a choice between an interesting, spectacular visual or a bland one… go for the spectacular one! It’s a very bad sign when your reader is thinking of something off-panel when you’ve just delivered the joke you spent four pages building up. I suppose if there’s something positive to say about this story, you could consider dealing with this compressed space as a necessary experiment in his development as a storyteller. For me, I’m glad it’s an experiment he didn’t delve in to again. Continuity: This is also Rosa’s only attempt at a Christmas story, which surprised me when I went to check my facts considering how beloved Barks’ own Christmas tales are. I suspect this has something to do with his attempt to maintain a consistent timeline within a Barksian universe. That’s not in any way possible considering the number of Christmas stories Barks wrote, but to any readers out there I present to you this challenge: I will award you, in the fine tradition of Stan Lee’s Marvel comics, the No-Prize for determining which Barks Christmas tale this could fit in to. Just post the story you think it could fit in (and your reasoning) in the comments section, and I’ll post the best responses in a separate post. Daisy makes her first appearance here and it’s a pretty boring one. Sadly, her later appearances wouldn’t fare much better. Rosa gives his thoughts on Daisy in a video below, and not to spoil it for you, but they’re not flattering.